Last night's much anticipated premiere of "Skywire Live with Nik Wallenda," with tightrope walker Nik Wallenda, "The King of the High Wire," making history as the first person ever to cross over the Grand Canyon, delivered 8.5 million total viewers P2+ from 8-10:20 p.m., and a whopping 13 million total viewers P2+ during the walk segment, shattering ratings records across numerous platforms, including social media, where it generated 1.3 million tweets, driving it to become the No. 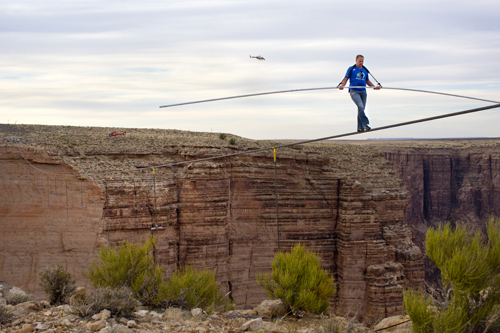 1 most social show across broadcast and cable in the U.S.
Wallenda, 34, took to the two-inch wire at 9:37 p.m. For the most part, his walk was smooth. However, at two points Wallenda had to take a knee on the rope. 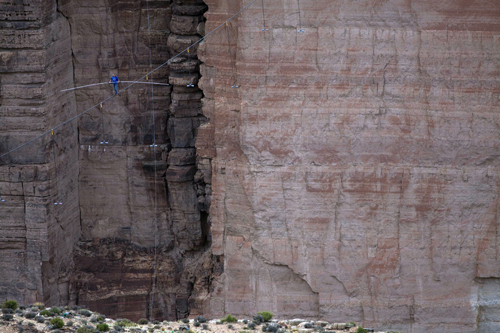 The first time was to adjust to the winds racing up from the canyon, while the second stoppage was to adjust the "rhythm" in the wire. 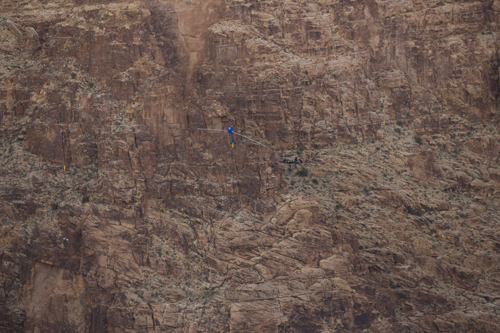 At the 22 minutes, 27 second mark, Wallenda gave the OK sign, blew a kiss to his family and friends waiting "on the other side," and then jogged the remaining few feet. In total, his walk took 22 minutes and 54 seconds. 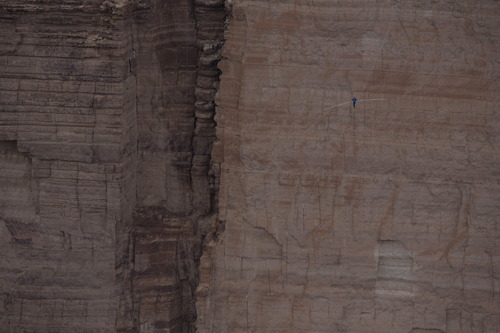 Once safely off the wire, Wallenda kissed the ground, gave hugs and kisses to his family, friends and team, and, with tears in his eyes, said, "I did it." 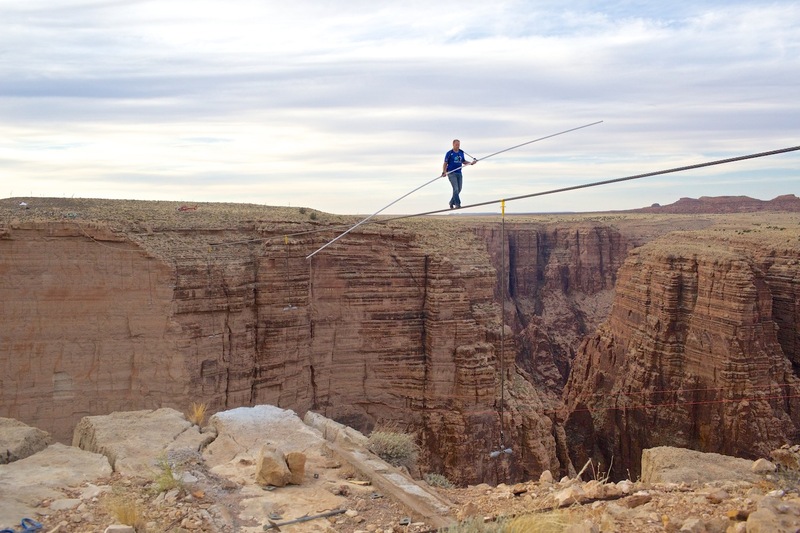 Wallenda's tightrope walk was higher than he had ever attempted before at 1,500 feet above the Little Colorado River - a height greater than the Empire State Building. In 2012, Wallenda became the first person to tightrope walk directly over Niagara Falls from the U.S. to Canada at a height of 200 feet. For that walk, the ABC Network required him to wear a tether. There was no such precaution on Sunday, as Wallenda, a seventh-generation aerialist, literally risked his life traversing the high wire. 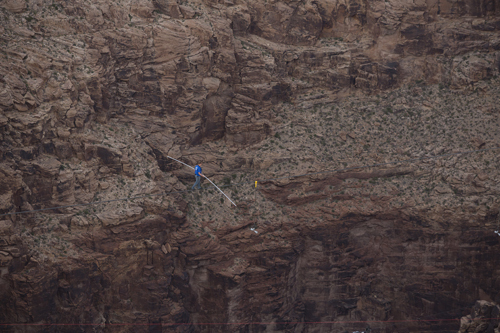 The "Skywire Live with Nik Wallenda" pre-show from 8-9:10 p.m. averaged 3.86 HH, 2.67 P25-54 and 6.25 million total viewers P2+ while the "Skywire Live with Nik Wallenda" main event from 9:10-10:20 p.m. averaged 6.43 HH, 4.77 P25-54 and delivered 10.68 million total viewers P2+. The walk segment from 9:38-10:01 p.m. averaged 7.72 HH, 5.87 P25-54 and delivered 12.98 million total viewers P2+. 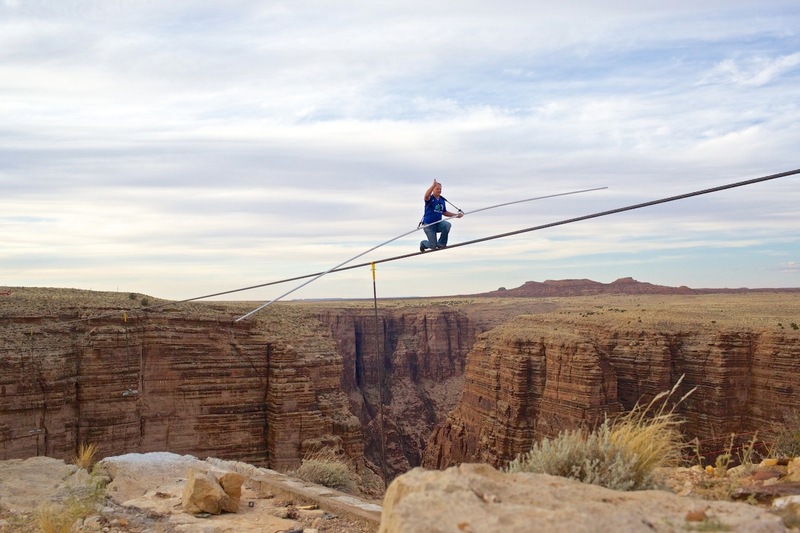 Discovery Channel delivered its fourth best primetime average ever with "Skywire Live with Nik Wallenda" and "Naked and Afraid." It was the best night for the network since July 2010. 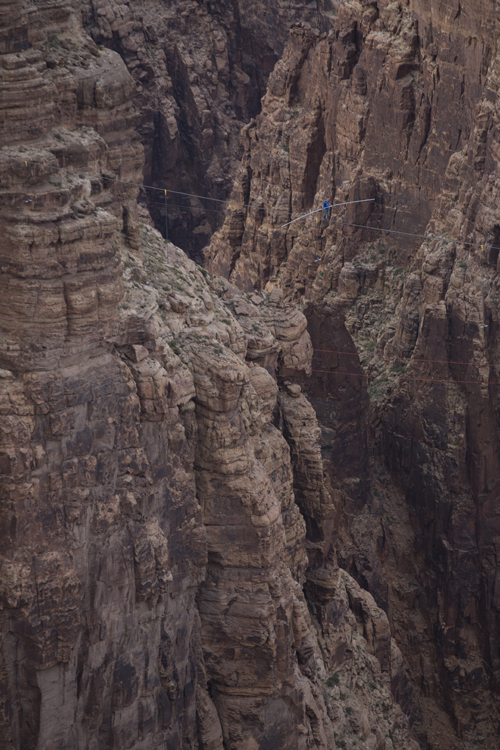 Earning a 4.77 P25-54, the "Skywire Live with Nik Wallenda" main event from 9:10-10:20 p.m. ranks as Discovery's highest-rated live event in all key demos. It's also the highest-rated special since "Walking with Dinosaurs" (7.99 HH / 6.16 P25-54) and "Raising the Mammoth" (7.84 HH / 6.40 P25-54) in March/April 2000. It bested iconic Discovery specials including: "Planet Earth," "LIFE," "Flight That Fought Back" and "Nefertiti Resurrected." It stands as the No. 3 Discovery special of all time in multiple key demos including: HH, P2+, P18+, P/M/W25-54 and P/M/W18-49 ratings and delivery. "Skywire Live with Nik Wallenda" had the world buzzing online and broke records for Discovery Channel and beyond, with the historic event generating 1.3 million tweets on Sunday and the special ranking as the No. 1 most social show across broadcast and cable in the U.S. according to Bluefin Signals, SocialGuide and Trendrr. As Wallenda completed his walk, Twitter volume peaked at 10:01 p.m. with 39,618 tweets per minute. Twitter buzz surged in the 9-10 p.m. hour with 647,917 tweets, and total tweets for the day resulted in 1.22 billion potential impressions. "Skywire Live with Nik Wallenda" generated numerous worldwide, U.S. and other national Twitter trending topics, with #skywire generating 1 million mentions for the day and the special holding seven of the trending topics worldwide at 10:08 p.m. According to Bluefin Signals, "Skywire Live with Nik Wallenda" also drove 71 percent of all social media comments surrounding TV in primetime on Sunday. Additionally, Discovery Channel's premiere of "Naked and Afraid," following "Skywire Live with Nik Wallenda," trended at No. 1 in the U.S. and Worldwide and "Shark Week" shared the spotlight on Twitter thanks to a new promo that debuted last night, with #SharkWeek, #SnuffyTheSeal and Poor Snuffy all trending in the U.S. Wired In, the online multiplatform experience at SkywireLive.com, invited viewers "backstage" with host Chris Jacobs providing real-time social updates during programming breaks and five additional camera angles - including two on Wallenda - during the walk. The engaging multi-camera offering generated more than 2.1 million streams on Sunday, peaking at 322,000 concurrent streams. 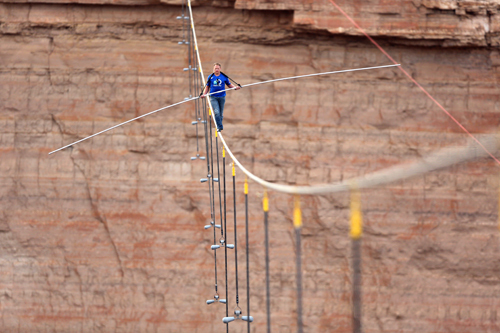 Since the launch of SkywireLive.com, the site has generated more than 6.8 million page views (4.4 million on Sunday) and brought in 4.8 million visitors (2.9 million on Sunday) with compelling short-form video, vertigo-inducing "Take the Walk" 360-degree interactive and more. "Skywire Live with Nik Wallenda" was seen live in 178 countries across Europe, Africa, the Middle East, the Americas, and Asia Pacific. 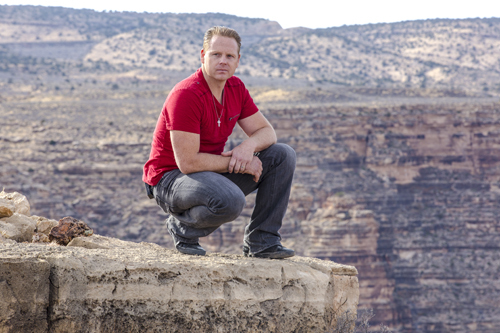 At the conclusion of "Skywire Live," Wallenda mentioned he would like to walk on a high wire from skyscraper to skyscraper.